Our original Contour CPAP Pillow boasts a more cushioned and supportive molded foam base plus a dual fabric design. The silky, quilted material follows the pillow’s contours so your CPAP mask and shoulders easily glide over these areas as you move throughout the night, all while your head is cushioned by soft velour. This sleep apnea pillow promotes proper support and contact free CPAP mask use. The pillow cover easily zips off for washing and additional replacement covers are available individually as are form-fitting pillow cases. 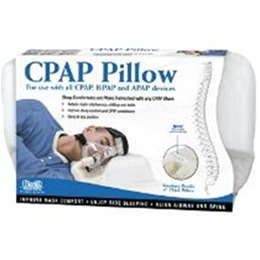 The CPAP Pillow is available in 2 height levels. Most users will be comfortable using the standard height (4") Lighter patients or those that prefer a thinner pillow should choose our standard profile model. Heavier, larger patients or anyone that prefers a thicker pillow should choose our high profile model. Each Contour CPAP pillow comes fitted with a custom, quilted pillow case with an attached hose tether to keep CPAP hose apparatus away from the patient.